In this modern world, we constantly engage and connect with thousands of people around the world. With the evolution in communication technology, you want to be ready and connected. The Vigor2925ac is meant for the family that has a never ending demand to be and remain connected. This WIFI router is in no means just an ordinary router. If properly configured and installed, It has advanced capabilities to handle your iPhone, iPads, Macbook, PC, Smart TV's and any WIFI or LAN gadget you own. The Vigor AP910C is an access point that extends your current WIFI network. It's concealed design allows to blend into the ceiling that doesn't destroy the interior of the home. Just Like the Vigor AP910C, this access point also extends your WIFI network but is meant to be installed and kept on table tops or mounted to the side walls of a room. The Vigor Switch P1090 brings them all together in one place so they can talk to each other and also provides them actual electrical power and internet at the same time. 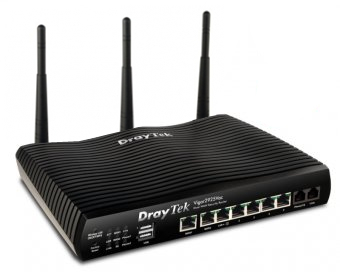 The Vigor Series routers are capable of handling traffic in multiple homes. The deployment can be done in such a way that they can talk to internet routers in your other homes around the world and make it seem like you are connected to the same network. The Vigor Series routers are capable of handling heavy use. Interconnected with Vigor Access points, you can have WIFI coverage anywhere in your house. You can also assign a different WIFI connection foryour guests so you don't have to give them your WIFI password when they visit. Internet can be harmful for kids and they are vulnerable to threats. The Vigor Series routers have a Smart Monitor that analyses network activity and keeps logs of the devices for the young family members in the house such as the websites they visit and timeline of whatsapp being used on their phones.